A couple of months ago, as we worked on adding templates to EmailOctopus, we discussed open-sourcing the work that our team had produced. A recent launch of paid email templates on Product Hunt had attracted significant interest and upvotes, so we believed there was a big opportunity for a series of free email templates. This formed the basis of a major lead generation campaign, with the aim to improve the profile and awareness of our email marketing platform. Two weeks later we launched those templates on Product Hunt. 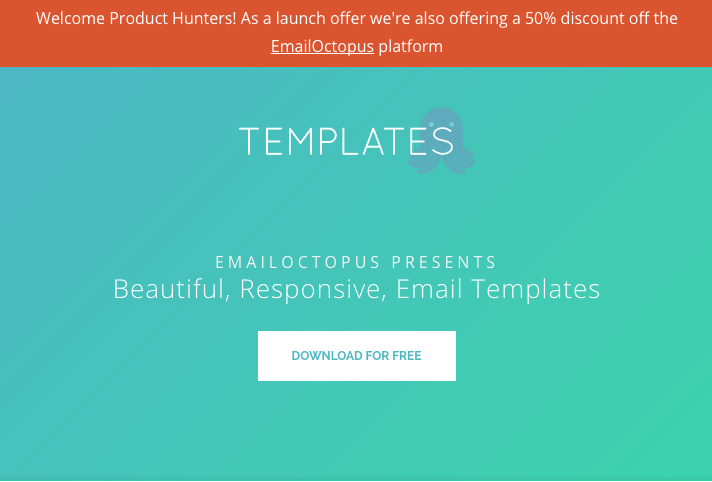 The totally free templates – as well as being used throughout the EmailOctopus platform – were made available through a dedicated microsite and GitHub. We provided them under the MIT License allowing our users to use them for anything; no strings attached. There are various theories around on how to rank highly on Product Hunt. What is known is that there’s a subset of users who have superpowers. Those superpowers, usually belonging to moderators or power users, allow them to post products straight to the front page and skip the ‘upcoming’ list. Product Hunt’s front page is the only place you’ll receive organic upvotes and exposure to customers, so reaching this was our top priority. To find the big influencers we used Yvo Schaap’s excellent leaderboard tool, and after identifying five potential contacts who may be interested in our product, we began reaching out for feedback. Sadly, despite receiving positive feedback from these users – our message in wanting to get hunted didn’t seem clear enough. In hindsight, perhaps we could have been more direct. Without an influencer we were going to need to do it the hard way. We were going to have to reach the front page via the hidden, low traffic, ‘newest’ list. A close friend of ours with posting rights (not everyone has permission to post on Product Hunt) willingly posted our templates microsite and we immediately hit the ‘newest’ tab. With the product live, we set about contacting all our friends, contacts and previous colleagues who may be interested in the launch. We also exported our team’s LinkedIn contacts along with their email addresses. We trimmed down the list significantly, removing the hundreds of recruiters and irrelevant school friends (sorry guys! ), and set about contacting them. It was key to never request an upvote, this is in violation of the Product Hunt ToS and will result in a ban – so we simply shared a link direct to our Product Hunt page along with a brief explanation of what we were launching. Many regular hunters strongly discourage sharing direct links to your product. There’s a theory that the Product Hunt algorithm weights against these votes, and it can prevent you getting the traction your product deserves. For EmailOctopus, however, this didn’t seem to have a detrimental effect. About two hours after sharing the links with our various friends/contacts, we had reached a lofty 26 upvotes and we’d entered the ‘featured’ list. Now on the front page, we could begin to sit back and hope that the organic traction would do the rest. We hit the front page at around 11.30am UK time, just in time for the USA to wake-up. There are numerous theories around the Product Hunt algorithm, but our launch shows that a good product can reach the front page irrespective of who posts it. I fully expect that alongside any algorithm, the Product Hunt team are actively keeping an eye out for a strong product to promote to the main page. Our upvotes over time, vs competing products. Our growth chart was much shallower than the likes of Pathwright – perhaps they had a more co-ordinated launch, but it’s more likely to be attributed to their strong product. As I write this, two weeks later, we’re up to 577 upvotes and third for the day, comfortably above the launch of Spotify Artists. So what impact did 577 upvotes and reaching the front page have on our business? Our templates microsite was a completely new product. Unfortunately, we do not have any historical data nor a baseline for traffic levels that we’d expect to see. That said, we can see an incredible spike in traffic on the launch day and most notably, on the day following the launch. Over the first two days we’d welcomed over 2,700 users to the templates microsite. This tailed off quite significantly over the weekend, but picked up slightly the following Monday. Perhaps launching on a Tuesday would have seen a slower curve, as Product Hunt does receive a lot less traffic over a weekend. The knock on effect was also noticeable on our core website. If we take a look at new users on our core product for the 3rd/4th November – and compare it to the previous week – we see sessions up almost 150%. The majority of this traffic came through the specific Product Hunt offer we ran on the template microsite. This promotion was run specifically for Product Hunt traffic, using the ?ref query string. When creating the microsite, we decided not to require an email addresses when downloading the templates. Although this probably goes against everything a ‘growth hacker’ would advise, our focus was on increasing the awareness of the EmailOctopus brand in what is already a crowded marketplace. That said, it would be crazy not to take the email addresses of users who were interested in the brand or email marketing in general. We agreed on the below mechanism, which would pop up after clicking the download button, but which would not block the download itself. The popup displayed while the templates downloaded. We believe the following mechanism worked fantastically. Of the ~4,000 users who visited the templates microsite, we had around 600 users download the templates. Around 40% of these went on to leave an email address. As of Nov 16th, 247 users had signed up for more information on the microsite. So two weeks on, how do we feel the launch went? Is Product Hunt worth the effort? For a standalone product, Product Hunt should not be the sole launch strategy and it should form as part as a wider, more long-term one. Product Hunt, much like Reddit, is based on a daily upvote ranking, meaning that the traffic comes and goes quickly – so it’s important to look beyond it. That said, Product Hunt is a great website for helping fellow early adopters and product enthusiasts find the next greatest tool. Launching on Product Hunt really does give the opportunity to any product, should it be good enough, to be exposed to tens of thousands of eyeballs. The interest and excitement on the day of being ‘hunted’ is unparalleled, and it’s a great chance to get feedback as well as exposure. 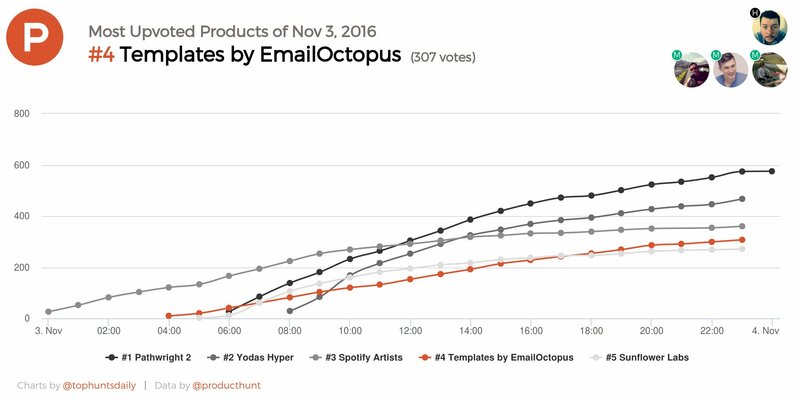 In our case, since our launch, overall traffic to our core EmailOctopus product has consistently increased by around 50%. As always, when comparing month to month data, there are numerous variables at play. But it’s more than reasonable to assume that the visibility and awareness gained on Product Hunt has been a big factor. Thanks to Ryan, the Product Hunt team, Chris (who hunted us) and those who upvoted and shared us. Use the Product Hunt leaderboard tool to find influencers who may be interested in posting your product. It’ll make reaching the front page, and your life, much easier. Being posted in the ‘newest’ list isn’t the end of the world. Look to friends, users of your product and contacts. Share your Product Hunt link widely so they can see your new launch. Never, ever, ask for an upvote. Post midweek. A Tuesday is ideal. Post early and aim to be on the front page just before the east coast USA wakes up. Ensure your website can handle significant traffic. We cached our landing page using Cloudflare and experienced no issues.